In light of it being #FinancialLiteracyMonth, there are some key values-based financial planning concepts and learnings that we have gleaned from different authors (including Seth Godin and Deitrich Dorner) over the years. You can find their books on our virtual bookshelf. When you first sit down with a financial advisor they will likely walk you through some sort of financial planning pyramid model that talks about taking care of your personal wealth first, and as your wealth accumulates you can start planning for your family and then your community. 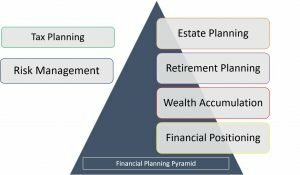 This makes perfectly logical sense, however if you don’t ground that pyramid in your core values and understand WHY you are planning what you are planning beyond the financial return you may fall into one of many pitfalls that come later in your estate planning. Instead of looking at your financial plan as a pyramid with your estate and legacy at the top, at the smallest point, consider looking at your plan as a circle. By placing your core values at the centre and building your plan around those values you can manage the risk and balance your financial life-cycle. By looking at your plan in this way you can have a clearer understanding of what you want the power of your wealth to be used for and at what stage in your life. 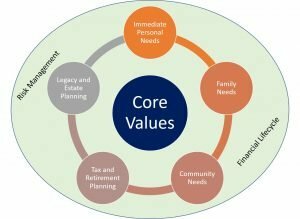 A values-driven wealth plan, means, at the core, you are consciously shaping your financial, consumer, community, and legacy decisions around those values. What makes these types of plans more successful than those that are purely financially motivated is that you have put your “whole self” into the centre of the financial plan. What Does Wealth Mean to You? – Defining what your wealth is goes beyond the monetary. What value do your personal connections hold? How do you define wealth beyond the financial? By defining this, you are beginning your journey down the road to achieving your social vision. It is your social vision that will be the end point for how you direct your social capital. Set Your Goals – What is your vision for society? Is it the eradication of homelessness in your community? Is it the creation of a society that has respect for arts and culture? Define your vision so you have a solid goal that you can direct your energies. Ask the Tough Questions – Don’t be afraid to seek guidance from others. Our website has several resources, including books from the aforementioned authors, for you to make informed decisions around your community investments, your social vision partners and communicating those ideas with your employees and family. Impossible vs. Improbable -Many things are impossible, few things are improbable. If your goal is the eradication of extreme poverty in your lifetime there are some distinct steps that need to take place to achieve that goal. It is not out of the realm of probability, especially because so many people are working towards a similar objective. Things are only impossible if we do not have a possible solution for them. Create a Realistic Plan – You have your vision identified, you have made it a priority now is the time to put the ideas into action. A strategic plan that generates social capital is one that keeps your social vision at the forefront and engages others in the journey. Your plan should outline who else needs to be involved (human and intellectual capital), how much needs to be invested (financial, emotional and time) and which businesses, organizations and community partners should be included. The Business of Philanthropy – There have been several blog posts, both on this site and others about the business of philanthropy. The charitable sector is a multi-billion dollar industry in North America and it is growing. Any transaction that you enter with community partners has a value. Be clear from the beginning what that value is (monetary, time or intellectual). Treat the relationship like any other business transaction. Your social vision is just as important (if not more so) as your business mandate. Engaging Others – Social Capital is all about engaging others. You generate financial, personal and emotional gain by sharing your vision with others. You will also see greater successes by integrating other people’s and organization’s visions with your own. Follow-Through – A plan is only as good as the person who is executing it. This is your social vision and your plan, so you have to make sure that you are following through on your actions.